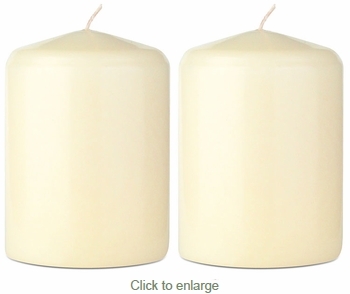 This set of two 2.75" x 4" classic pillar candles are hand crafted in Mexico and made with clean burning, purified paraffin wax. Our unscented 4" candles are the perfect size for lanterns, iron candle holders, or creating a decorative table centerpiece. Our unscented pillar candles come individually wrapped. Sold in sets of 2 candles. 6.5" and 8" pillar candles also available. See below.